Okay, Ruins Excavation was released today. If I haven’t miscounted, the anthology contains eighteen short stories by different writers and I happen to be one of them. It’s been quite a while since I had anything published. It’s nice to be back in the game. The anthology’s theme is one I found interesting and I’m proud that my story was accepted. Ruins Excavation is the fourth Ruins anthology edited by Eric T. Reynolds and published by Hadley Rille Books. As with the anthologies before it, the stories in Ruins Excavation have to do with archaeology and take place around ancient ruins. 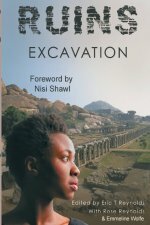 But Ruins Excavation differs from the others in that the protagonists are not only archaeologists, but are also women of color. I was up for the challenge. My story is pretty short, but I did quite a bit of research while writing it. I wanted to get everything right and I’m still worried that I didn’t. But even so, I enjoyed writing the story. My story touches on a subject that I had in other stories but hadn’t been able to sell. So, it’s nice to finally have a story published that touches on that subject. Ruins Excavation can be purchased from Amazon.com and other stores. But, at the moment, I don’t know which other stores are selling it. There are print and ebook versions available, though.